Check out the training session "Certified Kubernetes Application Developer (CKAD) Prep + Exam" at the O'Reilly Velocity Conference in New York, September 30-October 3, 2018. This is a full chapter from "Kubernetes Cookbook"—read the full book on O'Reilly's learning platform. In this chapter, you will find recipes that deal with both app-level and cluster-level maintenance. We cover various aspects of troubleshooting, from debugging pods and containers, to testing service connectivity, interpreting a resource’s status, and node maintenance. Last but not least, we look at how to deal with etcd, the Kubernetes control plane storage component. This chapter is relevant for both cluster admins and app developers. It is cumbersome to type full commands and arguments for the kubectl command, so you want an autocomplete function for it. For other operating systems and shells, please check the documentation. You have a well-defined service (see not available) backed by several pods. But one of the pods is misbehaving, and you would like to take it out of the list of endpoints to examine it at a later time. Relabel the pod using the --overwrite option—this will allow you to change the value of the run label on the pod. By overwriting this label, you can ensure that it will not be selected by the service selector (not available) and will be removed from the list of endpoints. At the same time, the replica set watching over your pods will see that a pod has disappeared and will start a new replica. You have an internal service that is causing you trouble and you want to test that it is working well locally without exposing the service externally. Use a local proxy to the Kubernetes API server with kubectl proxy. This service is not reachable outside the Kubernetes cluster. However, you can run a proxy in a separate terminal and then reach it on localhost. You can specify the port that you want the proxy to run on with the --port option. Note that you can now also access the entire Kubernetes API over localhost using curl. You want to react based on the status of a resource—say, a pod—in a script or in another automated environment like a CI/CD pipeline. Use kubectl get $KIND/$NAME -o json and parse the JSON output using one of the two methods described here. Note that the --raw-output argument for jq will show the raw value and that .status.qosClass is the expression that matches the respective subfield. Now that you’ve seen jq in action, let’s move on to a method that doesn’t require external tooling—that is, the built-in feature of using Go templates. 1Medium, "What are Quality of Service (QoS) Classes in Kubernetes". You have a situation where a pod is either not starting up as expected or fails after some time. Observe. What do you see in the container logs? What events have occurred? How is the network connectivity? Orient. Formulate a set of plausible hypotheses—stay as open-minded as possible and don’t jump to conclusions. Decide. Pick one of the hypotheses. Act. Test the hypothesis. If it’s confirmed, you’re done; otherwise, go back to step 1 and continue. - "echo I will just print something here and then exit"
24s         ... Pulling                 pulling image "busybox"
22s         ... Pulled                  Successfully pulled image "busybox"
As you can see, Kubernetes considers this pod as not ready to serve traffic as it encountered an "error syncing pod." 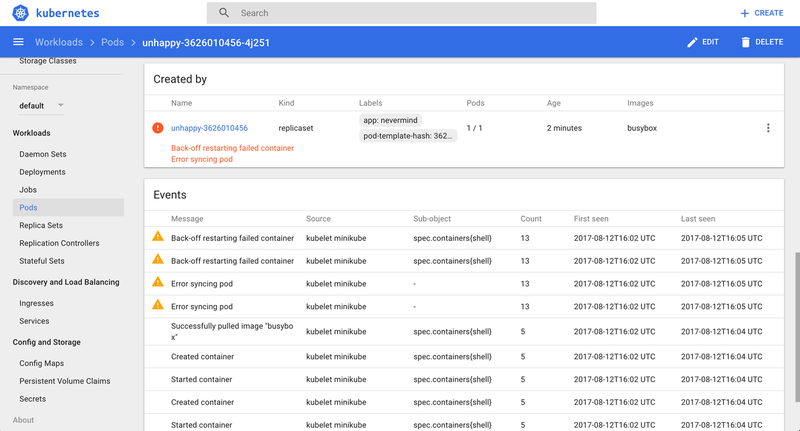 Another way to observe this is using the Kubernetes dashboard to view the deployment (Figure 1), as well as the supervised replica set and the pod (Figure 2). Is the manifest correct? Check with the Kubernetes JSON schema. Does the container run standalone, locally (that is, outside of Kubernetes)? Can Kubernetes reach the container registry and actually pull the container image? Can the nodes talk to each other? Can the nodes reach the master? Is DNS available in the cluster? Are there sufficient resources available on the nodes? Did you restrict the container’s resource usage? You want to get a detailed snapshot of the overall cluster state for orientation, auditing, or troubleshooting purposes. You need to add a worker node to your Kubernetes cluster. Reporting node and pod statuses to the API server. Mounting the pod volumes and downloading secrets. Controlling the container runtime (see the following). This is responsible for downloading container images and running the containers. Initially, this was hardwired to the Docker engine, but nowadays it is a pluggable system based on the Container Runtime Interface (CRI), so you can, for example, use CRI-O rather than Docker. This process dynamically configures iptables rules on the node to enable the Kubernetes service abstraction (redirecting the VIP to the endpoints, one or more pods representing the service). The actual installation of the components depends heavily on your environment and the installation method used (cloud, kubeadm, etc.). For a list of available options, see the kubelet reference and kube-proxy reference. 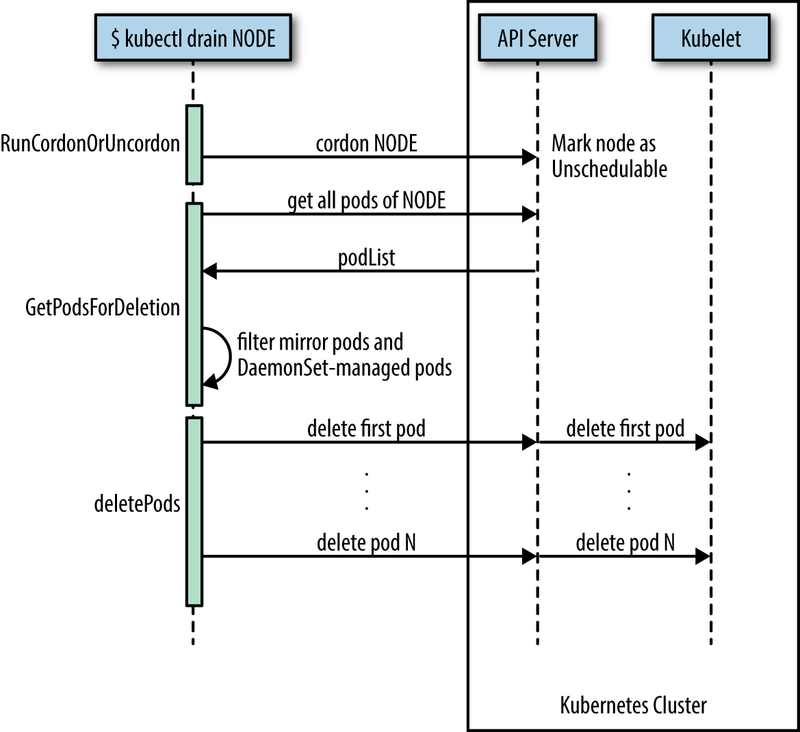 Worker nodes, unlike other Kubernetes resources such as a deployments or services, are not directly created by the Kubernetes control plane but only managed by it. That means when Kubernetes creates a node, it actually only creates an object that represents the worker node. It validates the node by health checks based on the node’s metadata.name field, and if the node is valid—that is, all necessary components are running—it is considered part of the cluster; otherwise, it will be ignored for any cluster activity until it becomes valid. You need to carry out maintenance on a node—for example, to apply a security patch or upgrade the operating system. When you are ready to put the node back into service, use kubectl uncordon 123-worker, which will make the node schedulable again. What the kubectl drain command does is to first mark the specified node un-schedulable to prevent new pods from arriving (essentially a kubectl cordon). Then it evicts the pods if the API server supports eviction. Otherwise, it will use normal kubectl delete to delete the pods. The Kubernetes docs have a concise sequence diagram of the steps, reproduced in Figure 3. The kubectl drain command evicts or deletes all pods except mirror pods (which cannot be deleted through the API server). For pods supervised by a DaemonSet, drain will not proceed without using --ignore-daemonsets, and regardless it will not delete any DaemonSet-managed pods—those pods would be immediately replaced by the DaemonSet controller, which ignores unschedulable markings. drain waits for graceful termination, so you should not operate on this node until the kubectl drain command has completed. Note that kubectl drain $NODE --force will also evict pods not managed by an RC, RS, job, DaemonSet, or StatefulSet. You need to access etcd to back it up or verify the cluster state directly. $ curl 127.0.0.1:2379/v2/keys/registry | jq . This technique can be used in environments where etcd is used with the v2 API. In Kubernetes, etcd is a component of the control plane. The API server (see not available) is stateless and the only Kubernetes component that directly communicates with etcd, the distributed storage component that manages the cluster state. Essentially, etcd is a key/value store; in etcd2 the keys formed a hierarchy, but with the introduction of etcd3 this was replaced with a flat model (while maintaining backwards compatibility concerning hierarchical keys). Up until Kubernetes 1.5.2 we used etcd2, and from then on we switched to etcd3. In Kubernetes 1.5.x, etcd3 is still used in v2 API mode and going forward this is changing to the etcd v3 API with v2 being deprecated soon. Though from a developer’s point of view this doesn’t have any implications, because the API server takes care of abstracting the interactions away, as an admin you want to pay attention to which etcd version is used in which API mode. In general, it’s the responsibility of the cluster admin to manage etcd—that is, to upgrade it and make sure the data is backed up. In certain environments where the control plane is managed for you, such as in Google Kubernetes Engine, you cannot access etcd directly. This is by design, and there’s no workaround for it. Stefan Schimanski and Michael Hausenblas’s blog post "Kubernetes Deep Dive: API Server – Part 2"
Michael Hausenblas’s blog post "Notes on Moving from etcd2 to etcd3"
Article image: Mindful instruction (source: Magnus D on Flickr). Michael is a Developer Advocate at Mesosphere where he helps appops to build and operate distributed applications. His background is in large-scale data integration, Hadoop, NoSQL datastores, IoT, as well as Web applications and he's experienced in advocacy and standardization at W3C and IETF. Michael contributes to open source software (Kubernetes, Apache Mesos, Apache Myriad, etc.) and shares his experience with distributed operating systems and large-scale data processing through blog posts and public speaking engagements.